You know, not many people cycle nowadays. 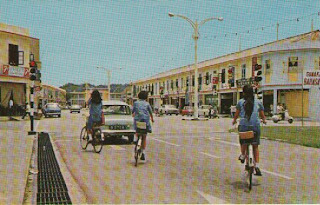 This postcard of Jalan Sultan in the 1960s is very interesting with these three girls cycling. These girls must be grandmothers by now. It would be interesting to know who they are. Interestingly enough, the traffic light was on. That traffic light at the corner of Jalan Sultan and Jalan Chevalier (now Jalan Pemancha) is the very first traffic light in Brunei Darussalam. 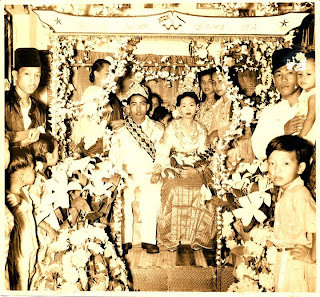 My cousin posted this photo of my aunt and my uncle getting married .... in 1954! The family had fun commenting on the photo and one of my aunties pointed out that the date of the wedding was also painted on the pelaminan. The year is visible but unfortunately the rest of the date is not very visible. What I was interested in was the simplicity of the pelaminan. Compared to today's pelaminan, this one is very simple. Not to mention, it is also very crowded and very narrow. I didn't realise you can get that many people on the wedding dais. The British connection is very strong too. Look at the Union Jack flag and the Brunei flag on the wedding dias' frame. A number of old photographs showed how closed the British are considered then. You would find many old photographs where people would be holding up the two flags together. Someone in one of the banks gave me a call and said that he had in his hand the $100 bill Brunei second series. I told him to hold on to it and today I wanted to get it off him. That was when he told me he had four of them and the numbers are in a sequence. That probably will make them worth more in the future. 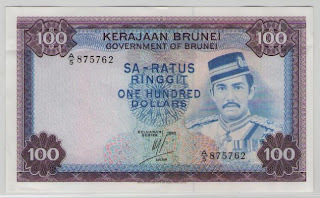 This $100 was the second series produced for Brunei. The notes were printed in 8 different years with the years clearly visible if you look at the note. The one that I have here is 1983. The notes were printed in 1972, 1976, 1978, 1980, 1982, 1983 and 1988. How much are these notes actually worth? I paid $400 for the four pieces but if I have to pay commercially, these would be worth around US$300 each depending on the quality of the notes. One of my nephews emailed me and asked whether I got anything on Kampong Ayer. He needed it for his final year project. I had to scratch my head and asked whether anything much has been printed about Kampong Ayer academically. I presumed there was plenty but off hand I can't remember much. Most of what I do know is historical but my nephew needed the studies for much more than that. Luckily I am on a two day MC. My left leg had cellulitis and is very painful. I had a shot of anti-biotics and had to rest my leg. Anyway, that gave me plenty of time to look around my study and to see whether I got anything. I found this rather old book published about 15 years ago. 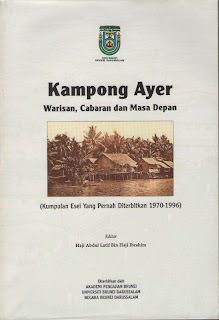 It's a mother lode of articles that are needed for one to cross reference anything on Kampong Ayer. Greetings from Bangkok. A picture is worth a 1,000 word. I came here with all the representatives of the countries in the world hoping to get something. You know what we got? So far nothing. The meeting could not even agree on the agenda! We haven't even been able to begin. When I returned on Saturday, this would be the shortest report to write. There were supposed to be 2 meetings - one on the Kyoto Protocol (WG-KP) and the other on Long Term Cooperative Action (WG-LCA). 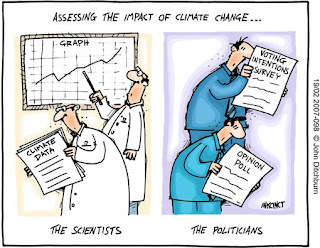 The Kyoto Protocol ends in 2012 and that needs to be renewed soon. The December deal in Cancun included a Green Climate Fund to manage $100 billion a year in aid to poor nations by 2020 and to limit a rise in average world temperatures to less than 2 degrees Celsius (3.6 Fahrenheit) over pre-industrial times. It also won consensus on measures to protect tropical forests and a framework to help poorer nations adapt to rising seas and greater weather extremes. Greetings from Bangkok. For those interested in the Climate Change talks, here is the update from United Nations Bangkok on the Climate Change Convention talks. Yesterday was the first day of the negotiations on the Kyoto Protocol. For those interested, the Kyoto Protocol is an international agreement linked to the United Nations Framework Convention on Climate Change. The major feature of the Kyoto Protocol is that it sets binding targets for 37 industrialized countries and the European community for reducing greenhouse gas (GHG) emissions. These amount to an average of five per cent against 1990 levels over the five-year period 2008-2012. This morning's announcement on the construction of houses under the Pilot Project to Upgrade Kampong Ayer, involving open areas in Mukim Peramu and Mukim Saba in Kampong Ayer, hopefully will make Kampong Ayer a better place especially as these houses that are to become model homes using environmentally-friendly material so that they are sustainable and safe for the environment. Its implementation is scheduled to begin in April and is expected to be completed at the year's end. Two types of houses will be built - 16 'A' type conventional houses and 49 'B' type, two-storey houses. Amongst the features of the houses that will be constructed is the use of environmentally friendly building materials which will replace the timber which is usually used for the houses in Kampong Ayer. 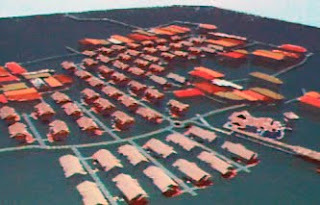 The spacing between the houses will also be taken into account to ensure further safety whilst also reducing the risk of fires in Kampong Ayer. I am here together with representatives of the world are meeting in Bangkok for the first 2012 round of climate change talks. This is the first meeting since the Cancun Agreements were reached in December 2010, which laid the foundation on numerous fronts towards achieving a fair, ambitious and binding global agreement to curb climate change in the future. The UNFCCC in Copenhagen in 2009 have not been successful. However in Cancun in 2010, there was a fragile compromise which helped put the UN negotiations back on track. There are hopes that at this round of climate change talks in Bangkok, the meeting will ge able to build on the progress made on certain issues in Cancun and greatly increase their levels of ambition if we are to avert the worst consequences of climate change.